Brief Description: Hoopla is a streaming video, audiobook, and music rental service that is free to patrons if a library subscribes to the service. Services: If a library has a Hoopla account, library patrons can sign up for a personal Hoopla account and borrow movies, music, audiobooks, and television shows for free. Everything is streamed, and rentals for movies and TV are for 3 days, music for 7 days, and audiobooks for 21 days. The items are automatically “returned” at the end of each rental period, or they can be returned earlier. At the Los Angeles Public Library, you can rent up to 10 titles per month, and it doesn’t matter what other patrons are borrowing – there are no simultaneous rental guidelines. County of Los Angeles Public Library cardholders seem to be able to borrow 8 titles per month. Items can be used on the computer or through a free app on a mobile device. Evaluation: Despite a smaller selection of titles than many of the streaming services – particularly in television, although there seem to be a number of British TV shows – Hoopla provides a great and easy service. I was able to create my account, select titles, download the app to my iPhone, and begin listening to music and an audiobook within about 15 minutes. The website has a few interface issues, but perhaps those will be fixed soon. For example, the white text beneath a picture does not actually link to the item – only the picture does that. When you click on the white description, you actually are brought to the next page of items. In addition, the movies/music/audiobook/TV menu bar is not always on the top of the page, so you have to hit “browse” to get to it. However, the fact that this is entirely free for library patrons, and you do not have to worry about returning the items since they are automatically returned, is a great thing. The music section, in particular, seems to have a great deal of selection options. Why This Service: Music, movies, and TV are, and will continue to be, huge, no matter how we access them. Having a free streaming service available to teens will get them to at least get their library cards. Brief Description: Learning Express Library is a portal that offers access to tests and courses in subjects for all grade levels and adults, included college preparation tests and job help. Services: In the Los Angeles Public Library System, you can log on to Learning Express Library with just your library card ID and last four digits of your phone number. Once on Learning Express Library, you must create a free account with them to access material, but once that is done, you can begin taking tests and courses immediately. Tests and courses (with approximate time it will take) are provided in many subjects (though not all: physics was not noticed in the high school area, for example) for all grade levels and adults. College preparation tests and courses are also supplied, and when taking these tests, there is a timer available for different sections, and the site provides immediate grading. Evaluation: Access to this site was quick and easy through the Los Angeles Public Library, and it took only about five minutes to start taking an exam, without having to read any directions on the website. It is fairly intuitive; as soon as you try to access something without having a free Learning Express Library account, it makes you sign up, but once you sign up, you are free to begin. The website itself has a slightly old looking interface with perhaps too many colors, but overall, this easy access to questions and answers about a variety of subjects, including college test prep, is invaluable. It can be accessed at home at any time, which makes it wonderful for teens who might resist asking for help. Company Information: From www.learningexpressllc.com: “LearningExpress, LLC is an educational technology company founded with the mission to help adult and student learners improve basic skills required for academic and career success. LearningExpress quickly emerged as an industry leader in both online and print resources. Why This Site: This is a test prep and learning site that can be accessed, for free, from the comfort of your home at any time with just a library card. This seems a great service to teens. Brief Description: Live tutor site that is available to library card holders, from home or from libraries. For the Los Angeles Public Library, it can be accessed from 3 PM to 10 PM PST, and is available to children, teens, and adults. 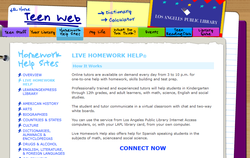 Services: Live Homework Help is a service provided by www.tutor.com. While price information is not available for libraries without submitting information for a quote, the service is available to library patrons for free, using home computers, library computers, or even through apps on iPod, iPad, and Android. To log in and request a tutor through the Los Angeles Public Library, you only need your library card bar code and the last four digits of the phone number associated with the account. No account is necessary with tutor.com to begin a session, but you can create a free account to access more features. You need this free account to use the apps, and you can also save favorite tutors, store assignments in lockers, and review and share previous sessions. To request a session, you answer some questions using drop-down menus: language (English or Spanish), grade, topic, subject, zip code, and how you are accessing the site. Then you write in a more specific question. After submitting, a separate screen pops up that tells you a tutor is being found. Once the tutor is found, a whiteboard window pops up and you use IM chat to talk with the tutor. The whiteboard includes options for sharing files, writing on the board, sharing pictures, and the tutor can share websites with the student. The tutor is not allowed to give any personal information, and sessions last 20-25 minutes. Tutors try to get students to a place in their work that will be a good stopping point, so if they need to start again with a new tutor, they can do so. For example, if writing a paper, they might try to get the student to compose a thesis statement in one session, and then a second session might be for an introduction. If a student shares a file, the document is shared with both tutor and student, and the tutor can visibly edit in front of the student and then send the edited document (with all of the tutor’s notes) back to the student. The website is also clear that it does not do homework for the students, but helps them to do homework. Students can request help with numerous subjects, including test prep. Evaluation: When I logged on and tried the service through the Los Angeles Public Library , at about 9:30 PM one evening, I found the interface very easy to use and within minutes was told a tutor was being found. Unfortunately, that started at 9:28, and by 9:34, no tutor had been found. There is no information about wait time, or whether the site is actually being contacted, which is frustrating. However, when I canceled that session and started a new one at 9:35, by 9:39 I had a tutor. He was very friendly and took me on a tour of the site. I’d initially said that I wanted to discuss The Fault in Our Stars, but then revealed I was also checking out the site. He had read the book, though, and indicated that if he had not, he could have transferred me to a different tutor, putting out a request for someone who had read it. One flaw with the service was that I couldn’t find an audio component, which seems important for the visually impaired. My tutor informed me there was a way to do voice tutoring, but I didn’t see it immediately, so that is probably something the site should make apparent. Despite that, I found it an easy, quick service, and I can imagine it is very helpful to students who are aware of it. Tutor.com offers one-to-one learning solutions for students and professionals. All of our services are live, on demand and online. Homework help, tutoring, peer coaching, professional development, training, career help –we do it all. But it really comes down to our core philosophy that when someone needs help the best way to get it is right away from an experienced expert. Our experts are online 24/7 ready to help. The results: 8 million one-to-one sessions completed. 90% of the students, teachers and professionals who use Tutor.com’s services would recommend us to a friend. Why This Service: A free way to get help with homework that is easy and does not cast judgment? This seems like a great service for teens!